Powerstrips aren’t exactly the most exciting of electronic devices. However, on occasion someone decides to be a little creative with the boring powerstrips. 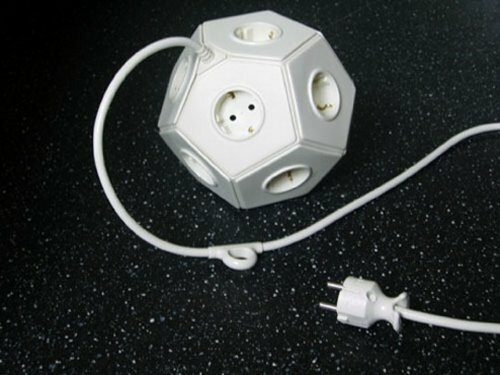 It also looks a bit like a D20 (even if it is a bit short on sides), which shows a bit of love for your D&D days, as well as the rest of the geeky games that involve dice. Even if your back in the day gaming was just last week. I know, it’s hard to get through those long work weeks to get to your weekend round of Magic. While MarshallAH.DESIGN may have not intentionally slipped in this powerstrip as one with an overabundance of geek appeal, I’m sure many could look past that. However, looking at the plugs it is quite obviously not a US product, so those of us in the States will either have to cry about it or pony up the dough for some adapters. Then again those in the UK won’t be holding this over our heads for long, since this is a design and sadly there is no info on selling it. Which means until this is actually created by someone, we are all stuck with our boring powerstrips.